fotoQuote® Pro 6, the industry standard guide for pricing stock and assignment photography, comes built-in to fotoBiz® X. 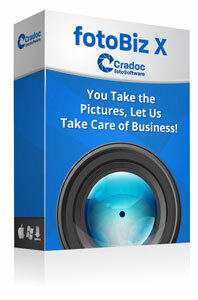 All new orders of fotoBiz X include the latest standalone version of fotoQuote® Pro 7 at no additional cost. 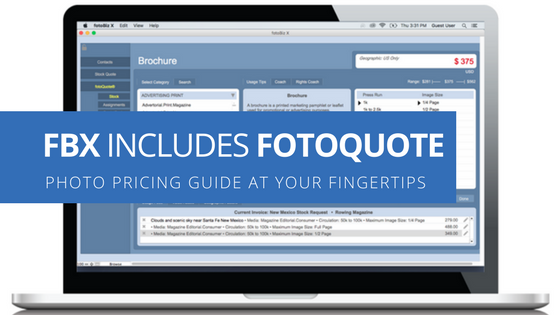 This means you have your photo pricing guide at your fingertips! 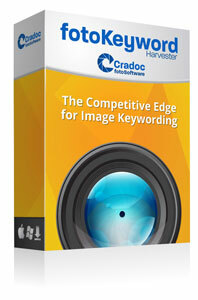 You now have at your fingertips the most powerful and useful information that has ever been assembled anywhere for pricing stock and assignment photography. The integration of fotoQuote into the fotoBiz® X workflow lets you quickly look up stock licensing and assignment usage fees. With a click of a button add usage licensing language and pricing to your stock quote, assignment estimate, or invoice. As a time-saving feature, you can automatically create an invoice from your stock quote or assignment estimate. The built-in photo price guide is integrated into the fotoBiz® workflow, connecting your clients to your paperwork. Other than this, the stand-alone version has the same video and photo pricing and negotiating features as the built-in version. To learn more about the fotoQuote® features check out the fotoQuote section of our website. 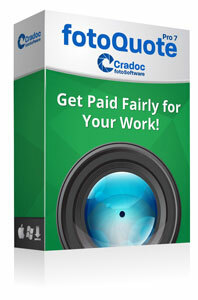 Because we want to make sure you have access to the most current prices we include our updated fotoQuote Pro 7 standalone for free. If you want to convert your quotes in fotoBiz® X to invoices, you use the fotoQuote Pro 6 that is built-in to fotoBiz X, using the fotoQuote Pro 7 standalone as a reference to make sure you are charging the most current price.